Washington Redskins owner Daniel Snyder. Photo by Patrick Smith/Getty Images. 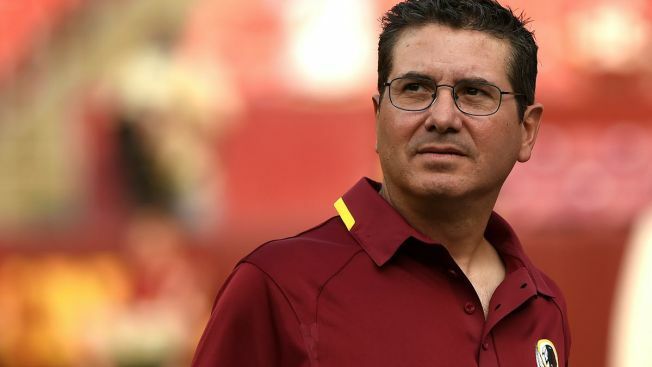 Redskins owner Dan Snyder has been voted the "most hated owner" in the NFL by Sports Illustrated. The news comes as Snyder continues to face opposition for supporting the team's controversial name, which some say is a racial slur. Snyder is adamantly opposed to changing the name, telling USA Today, "We'll never change the name... NEVER" in 2013. The Redskins have also been unsuccessful since Snyder purchased the team in 1999, said Sports Illustrated's rundown of "The Most Hated People, Places and Things in the NFL." "What has caused such strife between Snyder and Washington's fans?" the Sports Illustrated piece asks. "It starts with little things like Snyder charging them money to attend training camp -- a practice that's no longer occurring because of the backlash -- to the simpler explanation: He's been unable to produce a winner." News4 contacted Dan Snyder's press liaison, who declined to comment. Sports Illustrated said Snyder's closest competition for the "most hated" title would have been Jerry Jones, owner of the Dallas Cowboys. "Unfortunately for Snyder, the disdain for him has grown to such a level that it transcends merely the NFL. He may now be the most hated owner in sports, period," Sports Illustrated writes. The article even points to a discussion board on the Redskins' official online forums titled "Why is Dan Snyder the most hated person in franchise history?" Snyder is also facing a battle against the federal U.S. District Court, which earlier this month ruled in favor of five Native Americans who wanted the team's trademark protection cancelled. In June 2014, a ruling by the United States Patent and Trademark Office had cancelled six of the Washington Redskins federal trademark registrations. The recent ruling upheld the cancellation. Other Sports Illustrated titles were "most hated team," which went to New England Patriots, and the "most hated fan base," which went to the Philadelphia Eagles.